I am so excited. Jams are going to make a comeback in this household! Thank you, little lovely chia seeds, you have taken all the work out of jam-making. Seriously, it has been ages since we’ve had jam on or table. Possibly a year. Actually, maybe 2. I can vaguely remember my father bringing one of his creations, something delicious and tart involving blackberries and rosemary. After that jar was empty, we just did not replace it. We eat cold cuts, cheeses, smoked salmon and a LOT of peanut butter. In yoghurt and on waffles (check out my low carb waffles here) we have fresh fruit. I remember the first time I made strawberry jam with my daughter, using a recipe that required 50% sugar. After I had measured a truckload of white granules and poured it into the pot, I just felt deflated. Even after the sugar had dissolved and the jam looked like jam and tasted like jam, I couldn’t really enjoy it. The “healthy” sugar free jams you can buy in the supermarket, normally sweetened with concentrated grape juice, deliver the same kind of sugar rush the regular varieties do. Don’t be fooled by claims such as “no cane sugar” or “all natural” – they raise your blood sugar just the same. In terms of shop-bought jams, only the diabetic varieties do not play havoc with your body’s insulin levels. It is RAW. Meaning, no cooking required, no stirring, no time spent at the stove. All those lovely nutrients? Still hanging in there! RASPBERRIES. Soft, sweet and perfect jam making material. Can be mashed with a fork in less than a minute. No blending necessary, less washing up, more sofa time. VANILLA. Gives any sweet dish that special je ne sais quois. A taste so beautiful and refined you’d think the French must have invented it. Oh-la-la. CHIA. Little wonder seeds, which I waxed lyrical about in my cherry chia frozen yoghurt post. Low in carbs, high in fibre, the world’s richest plant source for omega-3 fatty acids and perfect for jams as they make things thicken and there’s no need for pectin, which some people don’t tolerate well. It is SUGAR FREE JAM! I used one tablespoon of erythritol, which made it just the right side of sweet. We had it with yoghurt and nuts for breakfast, but I am thinking jammy coconut flour pancakes for the weekend and also planning a grain free Victoria sponge with a raw raspberry vanilla chia jam layer. Oh my, I am salivating just thinking about it. This sugar free jam, friends. You CANNOT get a healthier one. Obviously, this recipe can be adapted and made with any soft fruit such as ripe peaches, strawberries, blueberries or blackberries. Knock yourself out and let me know which one is your favourite! 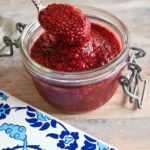 So quick to make, packed with flavour and sugar free: low carb raspberry jam. 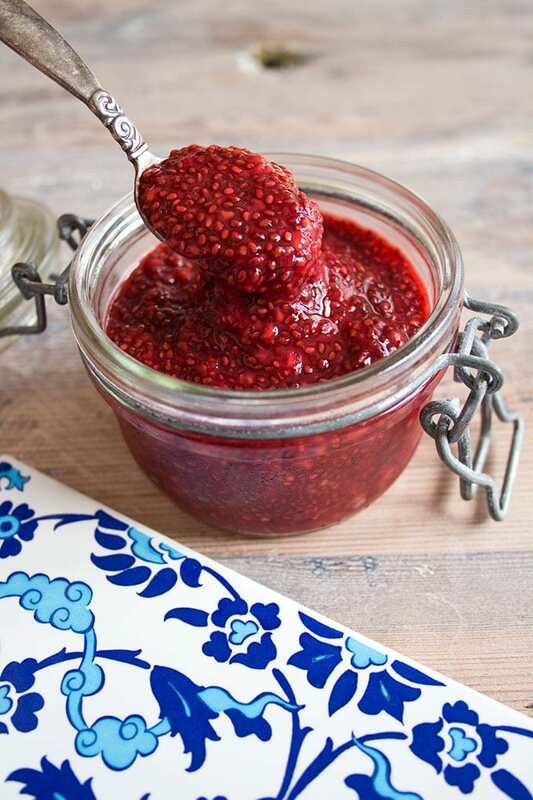 If you grind the chia seeds before using, your sugar free jam will have a smooth consistency. Thank you so much for this recipe; it was delicious! I’ve been missing jam since I started eating low carb and this hit the spot. So easy to make and I use it multiple ways. From a pancake topping to a filling for low carb cookies. And I can have peanut butter and jam again! And a little dollop with some pecans on top of plain yogurt makes a great simple, light meal when I’m pressed for time. It’s also REALLY good on a warm parmesan crisp with a little cream cheese. The possibilities are endless with this jam. Yes, you can absolutely make this jam seedless. I have also made it since with ground chia seeds. 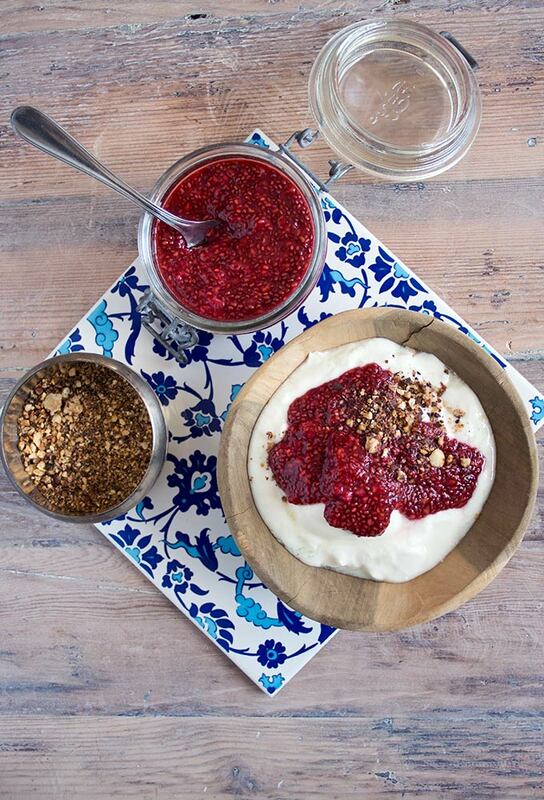 This way you don’t get the chia blobs and it becomes a really smooth jam. Looks delicious! I was wondering if you could tell me a few options to substitute powered sugar..
I’ve never tried it, but it should definitely work! Just came across your Website. OMG … I`m in love. Thank you for the great recipe ideas. My 7year old son loves jam and I`m always looking for a way to cut his sugar intake. My husband has joined me on my keto journey, so I want to have a few stables in the fridge for him, as he`s on parental leave and all day at home with our 10month old daughter. I`ll be browsing your Website to discover more delicous recipes. So glad you found my site. Hope you’ll try some of the recipes! Glad you like it Muriel! Can you convert the measurements for us from grams to actual cups, teaspoons, ect? Hello, I have updated the recipe with the US measurements. Hope you’ll enjoy the jam! 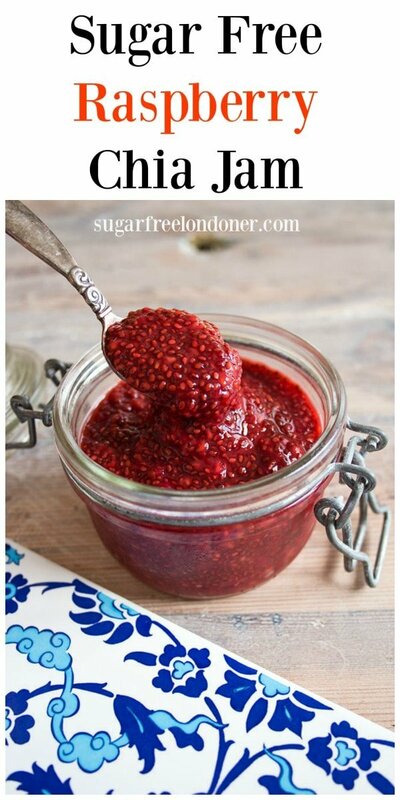 So glad I came upon your blog and this recipe…I was feeling so guilty even using sugar free jam. Now I can have my jam in the morning with my low carb bagel…brilliant! So happy you like the jam! How much is one serving? 1 tsp, 1 tbsp? I calculated there being 10 portions in 1 jar. Guess this would make it approx 1 tbsp. Of course you can! You’d get a smoother jam. Hi there, I’d really like to try this jam, could you please tell me how you make vanilla paste. Hi Cindi, you can either buy it ready-made or you get a vanilla bean and scrape the paste out of the inside. Alternatively, you can also use vanilla extract. This recipe is fabulous, I have been missing jam so much recently, it’s on my list to make, thank you for the inspiration!! I also eat sugar free foods but don’t like spending a day in the kitchen to create yummy delicious food. How long do you think this raw raspberry version will keep in the fridge? 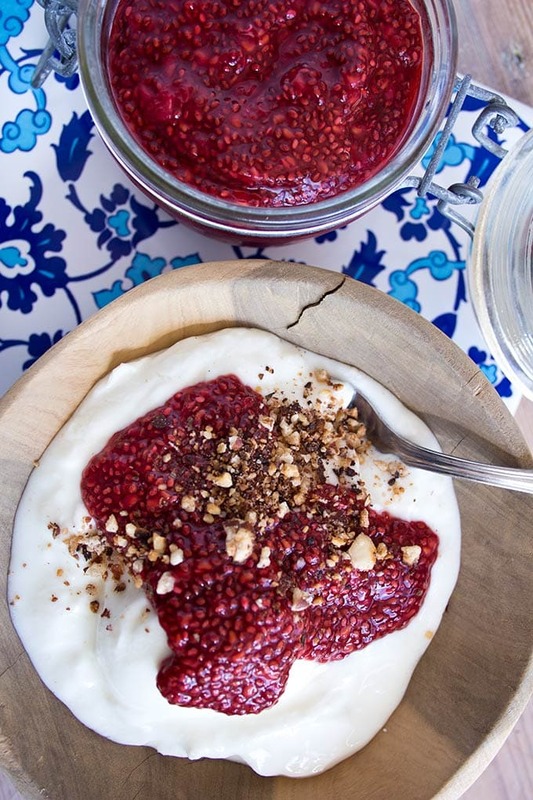 Raw raspberry jam with chia seeds? Love it! It looks amazing, tastes wonderful and it is sugar-free. Thanks for sharing!